Free things to do in San Francisco in April include festivals, street fairs, and other annual events. You will also find recommendations for some of my favorite no cost attractions and museums. My list of 25 includes highlights such as the Cherry Blossom Festival, free admission to our top museums, and the Opening Day on the Bay Boat Parade. Other activities include a visit to the Alamo Square Painted Ladies, a chance to watch the cables spin at the Cable Car Museum, and a stroll through our colorful Mission murals. In Japan, the arrival of the cherry blossoms each year is widely celebrated to get people outdoors and welcome in the spring. Here in San Francisco, the enthusiasm is just as great, as Japanese American cultural groups come together for two consecutive weekends to bring traditional music, dance, and food to the public. The SF Cherry Blossom Festival started in 1967 and has grown to be one of the largest in the US. Head over to Japantown to enjoy taiko drumming, tea ceremonies, delicious sushi, and much more, admission free. One of the most exciting free things to do in San Francisco in April for dance lovers is Bay Area Dance Week. The festival actually lasts for 10 days and encompasses a whole slue of events, including ethnic dance demonstrations, family dance nights, sample classes, choreography workshops, and more. You'll see (and try for yourself!) dances from all over the world, including India, Hawaii, Tahiti, the Balkans, Norway, Greece, and Latin America. These free events are a great way to get active and get exposure to other cultures. This free annual Mission District festival is held every April to commemorate the great labor and civil rights leader Cesar Chavez. In 1962, Chavez founded the National Farm Workers Association and continued to fight for migrant workers' conditions for years, especially in California. Now, the parade in his honor features indigenous and Latino traditional dances and makes its way from Dolores Park to the street fair at 24th and Bryant, where visitors can enjoy more music, dancing, sidewalk sales, and even a car show. One of my favorite free things to do in San Francisco in April is to take advantage of the free admission days at SF's top museums. Each month on designated days, institutions like the Asian Art Museum, Conservatory of Flowers, de Young, Legion of Honor, Museum of Craft & Design, and others allow visitors to get in and enjoy their regular exhibits completely free of charge. This is a huge benefit to folks traveling on a budget, as tickets can be pricey. Check the calendar in the link below to plan your free museum trips. The daily walking tours offered by SF City Guides are not only free but of outstanding quality, and cover a huge range of neighborhoods and topics. The knowledgeable guides are volunteers, and if you decide to leave a donation, it will go toward keeping this service available for future tourists. On these walks, you can discover the nooks and crannies of districts like Chinatown, North Beach, or the Castro. You can also explore architectural themes like Downtown Deco or the Pac Heights Mansions, and famous sites like the Golden Gate Bridge or Coit Tower. Pick from a large list of options and simply show up at the meeting spot on time. Enjoy the Pacific Inter-Club Yachting Association's Opening Day on the Bay celebration in April. Each year for the last century, San Francisco has hosted a parade of boats big and small along the waterfront to celebrate the first day of yachting season. This year, you'll see a spectacular variety of decorated yachts, a Tall Ship Battle, and maybe even a pirate ship or two. Head to SF's northern waterfront to find the best free seats in the house anywhere between Fisherman's Wharf and Crissy Field. As we inch our way toward summer, April brings us the beginning of this year's Union Square Live festival, which offers free performances in the plaza every Wednesday at 6pm and Sunday at 2pm from now until October. These live shows are great for the whole family and include a wide range of genres. Discover everything from salsa and tango dancing, to taiko drumming and lion dancers, to circus and theater acts. Many of them encourage audience participation, so go with your dance shoes on and get into the spirit right in the heart of Union Square. An excellent free activity for San Francisco visitors is hanging out in Alamo Square, a charming neighborhood with famed Victorian houses. You'll find this district up on a hill in the center of town with views of the downtown skyline and a lovely grassy park where you can have a picnic, just like in the opening credits of "Full House." The colorful Painted Ladies, with their ornately detailed facades, are spread throughout the city, but the Seven Sisters paint perhaps the most quintessential SF scene. You'll find this row of perfect Victorians lining the park on Steiner Street. Don't miss out on the great deals on Goldstar! They offer tickets for top tours and activities at up to 50% off the full price. Click the links below for details on these deals and to find other great tickets for your stay. The SF Cable Car Museum is a free attraction that many tourists miss. But if you love riding the shiny red cars up and down the hills--a uniquely San Francisco experience--you'll enjoy this look behind the scenes as well. The museum provides the history of this fascinating mode of transportation, and also serves as the station from which the live cables are controlled, pulling all of the city's active cars along their routes throughout the day. It's also where the cars are stored at night, and sometimes you can catch a fun glimpse of them leaving the barn. While in San Francisco, you cannot miss the opportunity to walk across the Golden Gate Bridge. This towering orange suspension bridge, which for a good part of the 20th century was the longest in the world, is the most iconic structure in San Francisco. Visiting it is a great way to snap close-up photos of this architectural beauty and take in a different perspective of the SF Bay and Pacific Ocean. The journey from lookout point to lookout point on either end is 1.7 miles, so put on your walking shoes and enjoy! 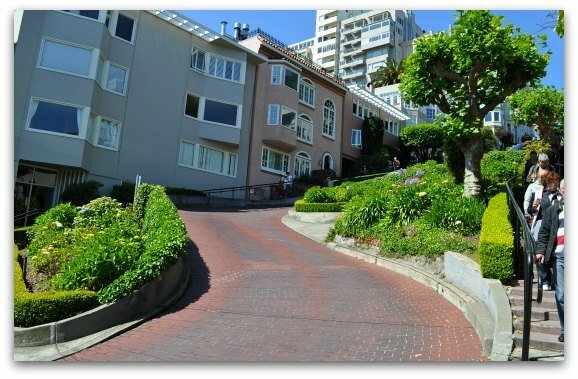 Another one of my favorite free things to do in San Francisco in April is to visit the most crooked street in town, a stretch of Lombard Street between Hyde and Leavenworth that curves eight times in the span of one block so that cars can traverse down its steep incline. The attraction is picturesque with its red bricks and manicured gardens, making spring the perfect time to visit and admire the lovely colors. Only cars can pass through the part that zig-zags; as a pedestrian, you can walk down either side and then take your pictures from the bottom. While strolling around the beautiful waterfront and enjoying all the shops, eateries, and entertainment that Fisherman's Wharf offers, take a minute to visit the free, small Maritime Museum to find out what made this area such a vital part of San Francisco's culture and economy. At the museum, you'll learn about the men and women who dedicated their lives to the water, from the indigenous peoples of this once marshland to the fishermen and modern shipping industries. You'll even learn about the marine life of this region. If you love urban art, the Mission District is the place to go. Here you'll find colorful murals in just about every nook and cranny of these lively streets. From the smallest drainpipes and trashcans to the entire length of four-story buildings, you'll find artwork of all sizes and designs. Many of these pieces have a social or political message, but all of them reflect the colorful, diverse culture of this part of SF. Look for Balmy Street and Clarion Alley to stroll through entire galleries of these beauties. San Francisco's Mexican Museum first opened in 1975 in the largely Latino Mission District, but has since moved to the Fort Mason Center where it has expanded to include several permanent collections. The galleries include Pre-Historic Art, Colonial Art, Popular Art, Mexican and Latino Art, and Mexican-American/Chicano Contemporary Art. This is the only SF museum affiliated with the Smithsonian Institute, so you know you're in for an excellent experience, with pieces from the Mayan and Aztec cultures to the best of the present day. The Randall Museum near the Castro District is a fantastic free destination for families with kids. It's not only educational, but packed with fun hands-on activities. Your children will love getting involved at the arts and ceramics studios, woodshop, science lab, and toddler playroom. In addition, the facility contains a greenhouse and gardens, a theater, and a live animals exhibit. The museum strives to inspire creativity, curiosity, and appreciation of our surroundings. One of the best outdoor free things to do in San Francisco in April is to hike the Coastal Trail from the Presidio to Baker Beach. You'll get an intimate look at this naturally beautiful part of the city that sometimes gets overlooked by tourists who only pass by it to visit the Golden Gate Bridge. The trail, in fact, offers some gorgeous and unique views of the bridge from among the trees, and as you walk along the waterfront, you'll not only get to enjoy the bay but the Pacific Ocean as well. The de Young Fine Arts Museum is perhaps best known for its incredible collections of art by renowned international artists, but did you know that you can still enjoy a part of the museum without paying admission to its art galleries? 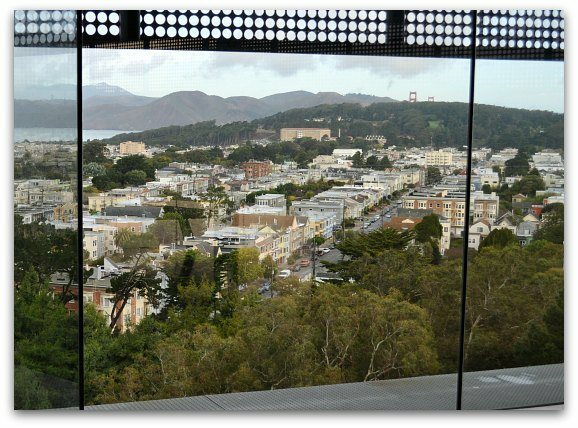 If you're going to spend some time at Golden Gate Park, head over to the de Young to visit its free observation tower, from which you can take in 360-degree views of the city, including the entire park, the top of the Golden Gate Bridge, and part of downtown. Twin Peaks is known for its breathtaking views of San Francisco and the whole Bay Area, as it is the second tallest point in the city. Many people drive or take a tour bus here to take photos. However, Twin Peaks is more than just the lookout point; it's the top of a 64-acre park that's full of beautiful trails and wildlife. Spend a little more time wandering around admiring the endangered Mission Blue Butterfly, the variety of birds, rabbits, and even coyotes. The controversial Mexican artist Diego Rivera completed his first work of art in the U.S. right here in San Francisco. 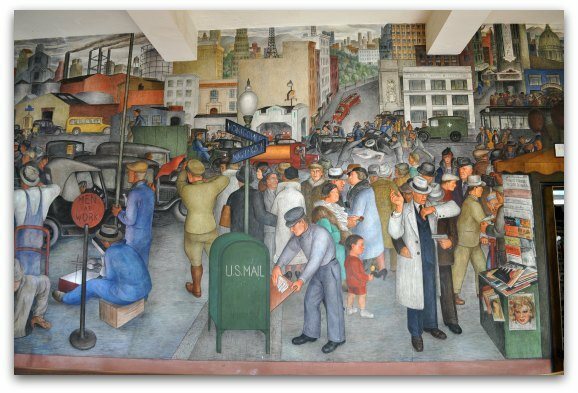 His legacy in the city includes three large frescos in public spaces, and more murals that were inspired by his style, like those of Coit Tower. To see Rivera's original, colorful, towering masterpieces, head over to the City Club, the SF Art Institute, or the City College of San Francisco. You will be impressed by just how large and detailed they are, depicting historical figures and everyday Californians of that time. City Hall in San Francisco is a marvel of a building, from the outside and the inside. This is a great free attraction to visit, because it's within walking distance of so many museums, theaters, and great bars and restaurants. In addition, you will get to learn about San Francisco history while history is being made in that very building! The outside is distinguished by its columns and golden dome (the tallest in the US), while the inside is known for the grand marble staircase in the rotunda. Upstairs, you'll see busts of Harvey Milk and George Moscone, who were assassinated here in 1978. One of the most peaceful free things to do in San Francisco in April is to take a stroll through the National Cemetery in the Presidio. This is one of only two cemeteries that remain within SF city limits, and it dates back to 1854. Over 30,000 military members are buried here. Apart from visiting the graves, the National Cemetery offers beautiful, tranquil views of the Golden Gate Bridge and the bay, and a nice spot to get away from the city and breathe. Stow Lake in Golden Gate Park is the perfect place to escape from the hustle and bustle and spend a relaxing morning or afternoon in nature, without leaving the city. 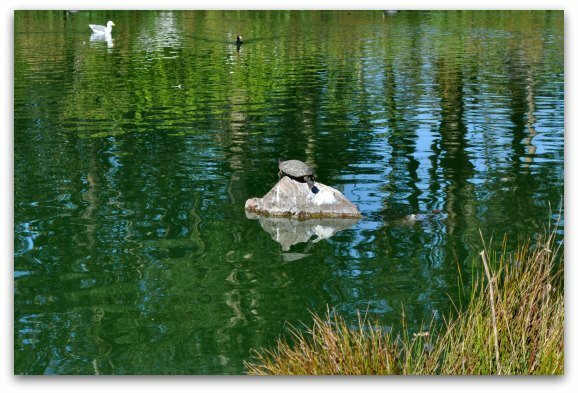 This man-made lake is surrounded by hiking trails, has a waterfall, and provides a home for lots of birds and turtles. You could rent a pedal or row boat to have some fun on the water, or simply enjoy the area's treasures, like the Chinese Pavilion or Strawberry Hill in the middle of the lake, accessible by bridge. Another one of the best free things to do in San Francisco in April is to visit the lovely Japanese Tea Garden during its free hours (9 to 10am, Mondays, Wednesdays, and Fridays). This place is serene and perfectly manicured, containing a high arching drum bridge, the five-story pagoda, the zen rock garden, and the dwarf tree collection. The best part about going at this time of year is getting to see the end of the cherry blossom season, when the trees appear to be exploding with pale pink--a revered time of year in the Japanese culture. You might not notice them if you're just walking the streets of Chinatown looking for great bargains and delicious eats, but the Chinese temples tucked away amidst the clamor of this busy neighborhood are peaceful, wonderful cultural sites that are open to the public and free to visit. Inside these places of worship, you'll find altars, statues, and colorful decorations important in the Buddhist and Daoist faiths. Delve a little deeper into the culture and take a look at this unique part of the Chinatown community. The famous Palace of Fine Arts is a remarkable structure that provides a serene setting for an afternoon walk or picnic. The gorgeous rotunda, columns, and reflection pond are the only remaining part of the 1915 Panama Pacific Exposition, a world fair that put San Francisco on the map and brought it back to life after the destruction of the 1906 earthquake. This particular installation was deemed simply too beautiful to tear down with the rest of the fair, so it sits waiting your visit in the Marina District. A great way to really get to know San Francisco is on one of our Hop On Hop Off Bus Tours. These tours are a great deal and take you from attraction to attractions throughout the day. You can hop on the bus and hop back off at an attraction you want to explore for a while. The Greyline Hop On Hop Off Bus Tour includes stops at places such as the Golden Gate Bridge (where you can hop on their bus to Sausalito), Alamo Square, and Lombard Street. You can also hop off on the stops near the Palace of Fine Arts, Chinatown, and Union Square. 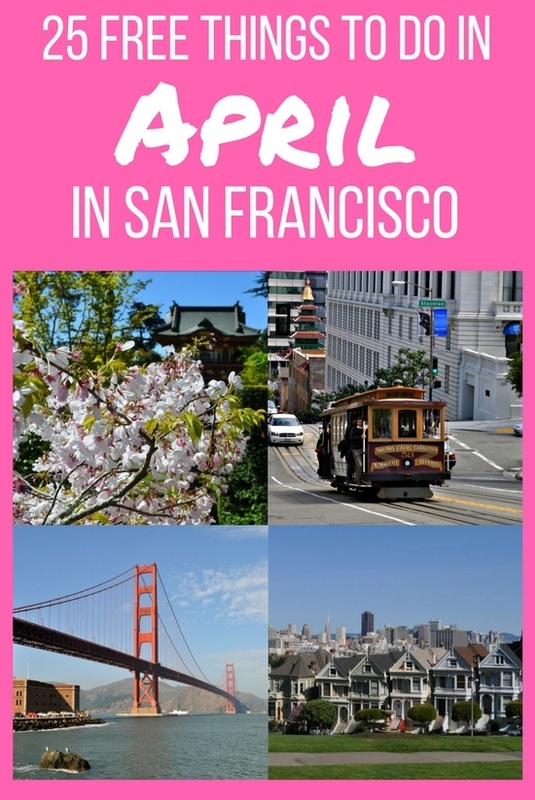 It's a great way to check out some of these free things to do in San Francisco in April, as well as some of our top paid attractions.